Oh my God, I would love a figure like this!! Nendoroid makes really good figures! They're pricey, but great quality! Please, Good Smile, make this a reality! Looks and sounds like top-notch quality. It'd be cool if this was a thing. I wonder how long has it;s been since any new news of new game.. This is so cute. I would love a small Rockman Nendoroid series. Nah, I'm with you, Rolina - they're too chibi for my taste. Wouldn't be a bad middle ground if the Powered Up style wasn't working, if they wanted to do updates of games or revisit Powered Up. The worst part about this? It's totally how I feel. This has been going on so long that I don't even have the passion to complain anymore. I'd love to get "powered up" with this little guy! He's so cute. Heh. I'd definitely buy it. It'd look swell alongside the Sonic and Link Nedoroids that are already things (which I don't have, but still lol). All painted nicely, this figure would be a worthy addition to any Mega Man collection, no doubt. Make it happen, Good Smile! The other writing on the card is in Japanese, so I'm rather curious as to why it's Mega Man and not Rockman? Is Nintendo using the Mega Man name in the Japanese version of Smash Bros? Either way, I'd love to have one. Gimmie gimmie gimmie gimmie gimmie gimmie gimmie gimmie gimmie, continue, ad nausium and etc. Please let this be a reality! I would buy 10 of these (plus one more just to have a normal blue Megaman) to correspond to one weapon from every game! 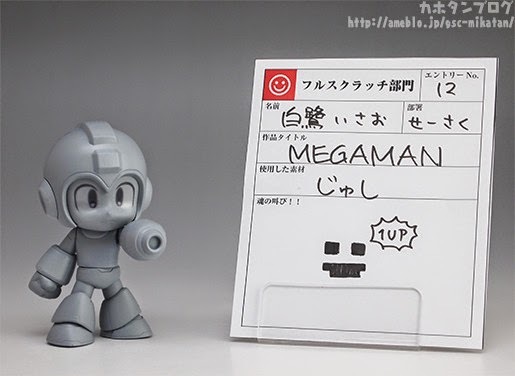 I have ALWAYS WANTED a Megaman nendoroid. ALWAYS. I was just thinking about this a few weeks ago when I was looking at nendoroids. I hope this gets released!! I will definitely buy it!! !